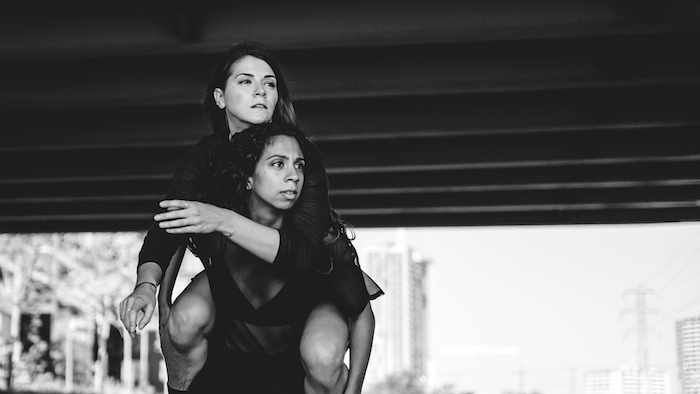 The choreography of Samantha Schleese and Melissa Hart (aka SaMel Tanz) accomplished great things in their 2017 Toronto Fringe production The “F” Word . It had moxie, technique, and communicated a powerful message. These choreographers are hungry and that passion comes out through their artistic decisions and the quality of work they create. It’s no wonder we’ve nominated them for Outstanding Contemporary Dance Production. Can you remember your first experience with dance and theatre? It’s very hard to pinpoint our first experience with dance and theatre as we were both exposed to both at a very young age. We are both fortunate to have families who love watching musical theatre, some shows that came to mind were Mamma Mia, Joseph and the Technicolour Dreamcoat and Casablanca. What is your dance training and background? Both of us received a BFA in Dance from York University. Sam completed her Masters Degree in Performance Dance in England and completed a UK Tour with MAP Dance Company. After completing her BFA degree, Melissa went on to dance for recording superstars such as Hedley, Jason Derulo and Sean Paul. We were also the official dance instructors for the 2013 WE DAY held at the Air Canada Centre in Toronto. We specialize in Contemporary and Hip Hop dance genres. How did the two of you meet? How did you start choreographing together? We’ve been the #friendshipgoals that people only wish to find. We’ve been best friends for over 10 years, studying together at York University and abroad in England, travelling the world, teaching various dance programs and living the performing artist dream. While in our 3rd year of studies, we travelled to Chichester, England on a 6 month university exchange program. There, we were exposed to contemporary dance in an entirely new light. Floorwork became our new best friend. Capoeria, Contact Improv, Cunningham and Physical Theatre were added into our dance vocabulary. Our understanding of space and movement greatly changed as we travelled to different European cities, watching performances and taking classes ultimately igniting our vision of creating our own dance company. After completing University, we continued to perform together, immersing ourselves in the Toronto dance scene, (commercial, contemporary, Hip hop, latin) as well as exploring our own work as SaMel. 5 years later, our versatile backgrounds have influenced and created captivating movement and stories. SaMel Tanz debuted our first full length show in 2015 “Follow Me” at Dancemakers. In The “F” Word, the choreography was exceptional. What inspired your movement? Thank you for appreciating our movement. We began our creative process with researching the 3 waves of feminism and advocates who fought/fight for gender equality and women’s rights. We collected readings and visual recordings, buzzwords, physical expressions and themes that spoke to us to move our bodies. With our gathered research we entered the studio to reflect and brainstorm movement vocabulary. Using contemporary techniques such as repetition, speed and texture we developed vocabulary that was later created into sequences. We then collaborated with our dancers to see how the movement looked on their bodies. These sequences were manipulated further by the placement on stage, reversing the order of movement and if physical contact between dancers could be made. We observed the sequences to ensure our intention and emotion was clear to reflect the themes of feminism. We experimented with multiple dancers in the space and then created specific group, trios, duets and solos sections. What inspired you to create The “F” Word? One of the most vivid memories that inspired our work was the The Women’s March of 2017. Seeing women band together to call out the naysayers and the indiscretions made against them was commanding. And to watch women rise up and empower people (especially other women), to speak up for what we deserve, “a seat at the the table”, lit the fire in our hearts to claim space in the dance and theatre world for ourselves! SaMel Tanz is surrounded by such powerful, motivated, hardworking women. From our mothers, to our dance crew DEUCEnDIP and to our extended dance community. We wanted to be apart of the change and researched what women had done before and what we could do today. We also understand how privileged we are to showcase such a topic through dance and know we have a long way to go as major factors like class and race still are impacting women not just in Canada but around the world. What were some of the changes you made to The “F” Word in the remount at The Next Stage Festival. In addition to changing the name of the production from “The “F” Word” to “that “F” word”, we wanted to bring a clearer intention to all elements we discuss in the show. Therefore we recreated phrases of movement to help the show transition more smoothly. We added new pre-professional dancers to give them experience being apart of a professional festival as part of our mission to give back to the next generation. We added a new professional dancer to give a fresh confidence and different dance style to the show. And finally we changed the order of the topics of the show to end with a powerful climax and have the audience members feeling empowered. What are your current creative projects? 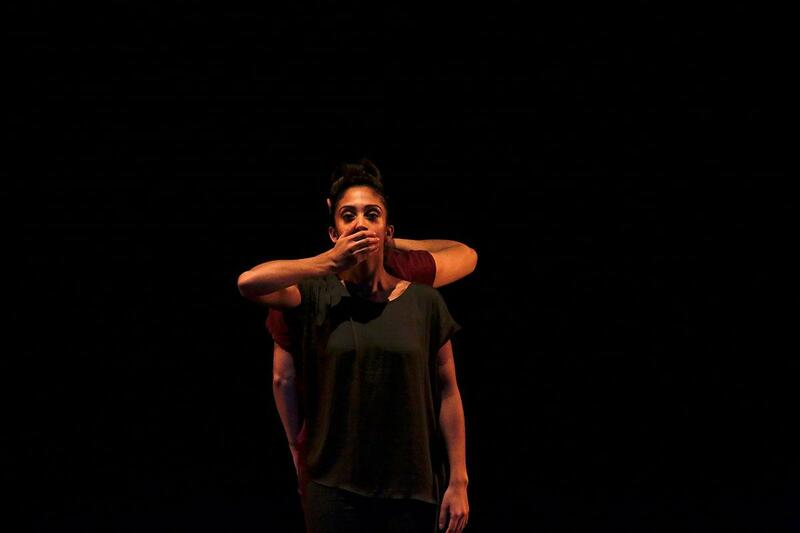 Currently SaMel Tanz is creating an outdoor performance that addresses Mental Health issues in our dance community. We have recently shared our knowledge and experience with other dancers at the On The Move – Dancer in Transition Conference at the Sony Centre this February. Thank you for considering SaMel Tanz for these Awards. We are extremely grateful to be recognized amongst the other nominees.